Kasi Lemmons directs Talk to Me about Petey Greene (Don Cheadle), an ex-con who, with the help of program director Dewey Hughes (Chiwetel Ejiofor), rises to fame as a free-spirited radio talk show host for Washington, D.C.'s WOL-AM during the 1960's. Inspired by a true story. Kasi Lemmons has previously directed The Caveman's Valentine and the superb Eve's Bayou. I had the privilege to interview her. 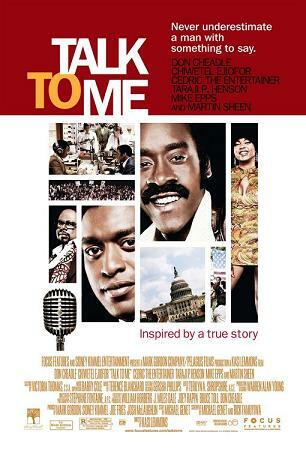 Focus Features will release Talk to Me on July 13th, 2007 at AMC Empire 25, AMC/Loews Lincoln Square, Regal Union Square 14 and AMC Magic Johnson before expanding to more theaters on July 27th and going wide on August 3rd. NYC MOVIE GURU: Did the producers always have you in mind to direct Talk to Me? KL: I wasn’t a shoe-in. Even though the script had come to me, over the years, I read several different drafts of it. I lobbied for it. The only time I was ever self-conscious about being a woman was [in] my first meeting. Not just because I was a woman, but because you couldn’t look at my first two films and say I was the right director for Talk to Me. That being said, it made me very prepared when I went to that meeting. I talked them through what I wanted the film to be. I think I really won them over in the meeting by what I was saying. NYC MOVIE GURU: What kind of research did you do? KL: Mostly what I did was that I talked to Dewey [Hughes]. He was actually a resource for me [and for all of the other departments] all the way through the shooting. I didn’t do a lot of research that you would think I might have done, by choice. I wasn’t even legally allowed to read the book. When I decided that I wanted direct the movie, I wanted to focus it on the friendship [between Petey and Dewey] and to look at it as a movie. I listened to [Petey’s] voice, watched some of his shows, read a lot of articles and talked to Dewey. That’s all the research I did besides the research on the period of the D.C. riots, for example. NYC MOVIE GURU: What was it like balancing the comedy and drama? KL: It was very important to me. As a director, it’s the most fun you can possibly have, especially switching it very quickly from comedy to drama. I knew that if had great actors, [they’d] be funny. Comedy is funniest when it’s perfectly grounded. There were a lot of places where I wanted to go just to the edge and then pull back. I feel that way about melodrama, too. I thought [the actors] were hilarious. Martin Sheen called me after he saw it and said, “You’re really, really funny”. NYC MOVIE GURU: What does Petey Greene’s story mean to you? KL: For me, it represented a way of speaking loudly. I was going through a period of frustration with what I was seeing both in my industry and in the greater world in just cautiously speaking, measured speaking, people scared of being labeled “un-American” , or “unpatriotic”. I struggle with this and we all do. [Petey’s] voice was so spontaneous, which is one of the things I liked about it. I thought that was really appealing. Also, there’s the activism of that time, which I don’t mean to romanticize. I wanted to show how devastating and alive the 60’s were. Also, Talk to Me, is a statement about friendship and how we all have to fight our instincts to try to change people. NYC MOVIE GURU: How has talk radio evolved since the 60s? KL: I think it’s changed a lot, but it was monumental at that time because there was less noise in general. Now, with the internet, everything’s kind of diffused. It’s harder to break through. But, at that time, when you could focus on one voice, it was a monumental importance and I still think it’s [still] important [today]. I think there are Petey Greenes out there in every city who are influencing and hoping to shape communities.